Solid burnt clay brick industry has been used in India for a long time, dating back to as far back as the great river valley civilizations of Harappa. In the last three decades, however, propelled by economic and population growth, and urbanisation, we have seen the industry growing rapidly, with production increasing from 50 billion bricks in 1985 to 243 billion in 2015. Over the next 40 years in South Asia and Africa, 150 billion sqm of new buildings are expected to be constructed. This is almost 3 times the existing building stock in these regions, and will require huge quantities of materials for construction such as bricks, a significant amount of which are being made in India. 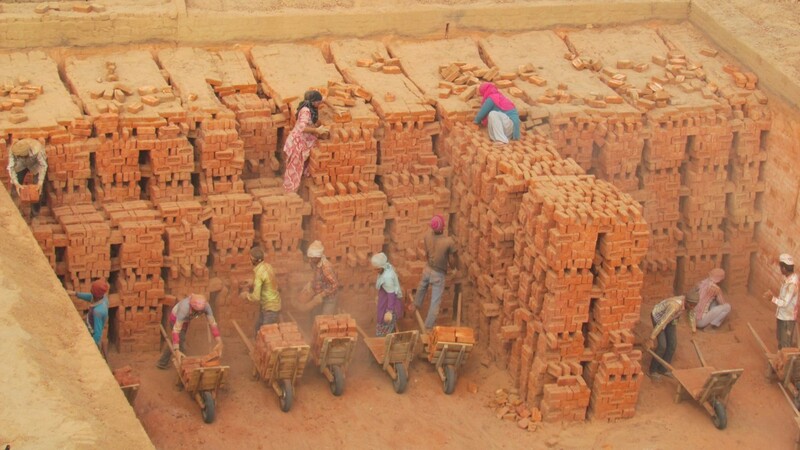 There are almost 1,40,000 to 2,10,000 kilns producing solid burnt clay bricks, most of these are ‘informal’ enterprises, located in peri-urban and rural areas. These kilns are usually non-mechanised or adopt basic levels of mechanisation, and are estimated to employ about 10 million workers (mostly seasonal migrant workers). Despite the employment it gives, the rapid expansion of the industry with only small technological improvements raises several urgent environmental concerns. Manufacturing solid burnt clay bricks consumes about 31 million tonnes (MT) of coal a year, making them the third largest industrial coal consumer after the iron and steel industry, and cement industry. The CO2 emissions from the solid burnt clay brick industry are estimated to be 66–84 MT per year. At the same time, the poor working conditions and non-adherence to existing labour laws and regulations can no longer be ignored. Worrying practices such as, bonded labour, poor working conditions, and child labour plague the industry and needs to be corrected without further delay. Overcapacity, low profitability and complex environment regulations are also issues that industry grapples with. With all these gaps and concerns, perhaps it is time to ask if the solid clay brick industry is still relevant in today’s world. And if at all it is, how does the industry need to evolve and erase its many shortcomings? Resource efficient clay bricks can significantly address many of these issues and still meet the huge amounts of bricks that the industry will need to produce to meet demand. We estimate that the demand for bricks will reach a peak of about 1000 billion bricks a year during the 2032–37 period. This would be 250% increase over the demand for 2012–17 period. To cater to such a huge demand, India will require a variety of of resource efficient bricks based in various geographical locations. In the second part of this series of blogs, we will look at fly ash (pulverized fuel ash) bricks and whether the quantity of fly ash available is sufficient to meet the brick demand in the country. Kamyotra J S. 2016. CPCB presentation titled “Brick Kilns in India”. Presentation made at the workshop on “Roadmap for Brick Kiln Sector Challenges and Opportunities”, organised by the Centre for Science and Environment at New Delhi on 8 February 2016. Kumar S. 2016. TERI presentation titled “Options for Walling Materials and benefits of using REBs in building construction”, organised by Punjab State Council for Science & Technology at Chandigarh on 24 May 2016. The Energy and Resources Institute (TERI). 2016. Report on Resource Audit of Brick Kilns. New Delhi: TERI [Project Report No. 2015IE22].